Abstract. Secondary succession on arable fields is a popular system for studying processes influencing community assembly of plants. During early succession, the arrival and establishment of those propagules that can pass the environmental filters operating at a given site should be among the dominant processes leading to an initial increase in species richness. With ongoing succession, environmental filtering should decrease in relative importance compared to competitive interactions, which then should decrease species richness. Thereby, the phylogenetic structure of communities should change from random or clustered patterns during early succession to overdispersion. Disturbance is supposed to act as an additional filter, causing communities to be phylogenetically clustered. By analysing the species richness and phylogenetic structure of secondary succession in two different regions in Germany with three different disturbance levels each, we tested this general model. Although in one of the regions (Gimritz) we found the expected trajectory of species richness, phylogenetic structure did not follow the expected trend from random or clustered towards overdispersed communities. In the other region (Bayreuth), species richness did not follow the expected trajectory and phylogenetic structure remained clustered over the course of succession. 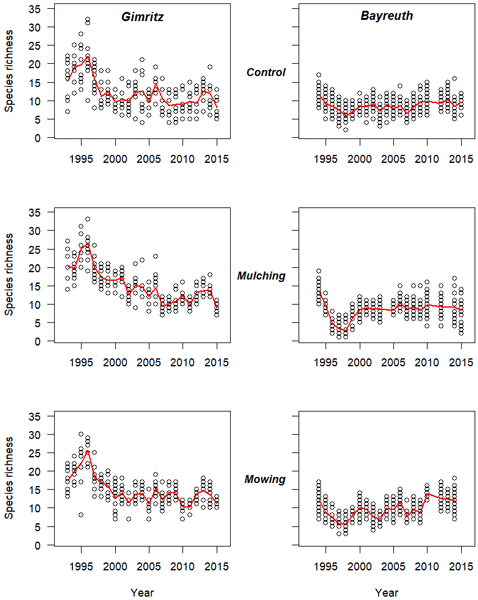 A preliminary analysis of autecological characteristics of the species involved (Ellenberg indicator values) nevertheless showed clear contrasting trends. The idiosyncrasies of successional trajectories across sites might be due to the environmental context, the regional species pool as well as the legacy of former land use reflected in the seed bank. How to cite: Stadler, J., Klotz, S., Brandl, R., and Knapp, S.: Species richness and phylogenetic structure in plant communities: 20 years of succession, Web Ecol., 17, 37-46, https://doi.org/10.5194/we-17-37-2017, 2017.